The making of a hand knotted rug is a centuries-old process, handed down over generations and perfected with modern inventions. The process is meticulous, time consuming, and requires highly skilled artisans at every stage. From washing and dyeing the wool, to weaving the carpet, to finishing it, takes anywhere from 12 to 16 weeks for an average 9’ x12’ rug. We use the very best wool from sheep living high up in the majestic mountains of the Himalayas. Because of the high altitudes, these sheep need to produce more lanolin, or natural oils, to keep warm—resulting in wool fibers that are long, strong and have a gorgeous texture. Our factories in India and Nepal buy wool from nearby markets, clean and wash it thoroughly, then spread it out to dry in the strong sun. Washing the wool is a delicate process: some of the lanolin needs to be washed out so that the wool doesn’t repel the dye, but not too much or the wool will be hard to handle. The men and women in our factories have perfected this process over many years. When the wool is dry it is hand-carded, or combed, to align the fibers. The carded wool is then spun into yarn by highly skilled, experienced spinners using a traditional wooden spinning wheel. It is a delicate and impressive skill to be able to pull a few wool fibers and twist them into yarn— constantly batching in more fibers as the yarn is created. Hand-spun wool is more variable, and more valuable, because it absorbs color in a much more variegated, rich way. It’s more resilient and stronger than machine-spun wool—and the distinct pile direction created with hand-spun wool gives the rug gorgeous, subtle shifts in color depending on the light.The dyeing process is overseen by a master dyer, with exceptional attention paid to each batch of dye. 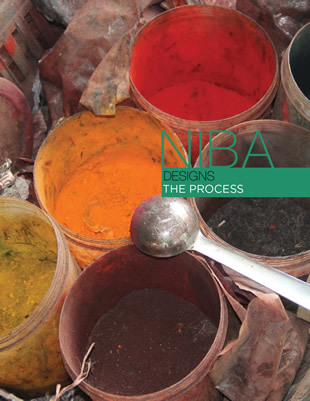 Traditionally, dyeing begins in huge copper vessels. The wool is dyed in small lots, by hand. Pigments can be vegetable , or metal complex dyes from Switzerland. The metal complex dyes enable better color consistency, and they never bleed or fade in sunlight. After dyeing, the yarn is again laid out to dry in the sun. For each of our rugs, our master weavers create a full-scale graph, outlining the design of the rug in exactly the right size and scale. This goes on the loom for the weavers to follow when making the rug. The weaving of these gorgeous carpets is done by hand, knot by knot, using a traditional Tibetan method known as Senna Loop, or the Double Knotting system. Each knot results in a single point of color in the pile of the finished carpet. There could be up to a million knots in a single carpet, each one of them tied by hand! A knot is made around two warp cotton threads, then the wool is looped around a metal rod, which is placed vertically across the loom. (In Persian knot no rod is used and every weft not is individually knotted to the warp thread) When a given row of knots is completed, they are beaten and cut, freeing the rod and exposing the pile. Weavers at the loom knot row after row, creating a dense, luxurious carpet. Once the weaving is finished, the carpet is cut down from the loom. Now our rug is woven, but not yet complete. It must be washed for a minimum of one hour with the use of wooden paddles, soft brushes and combs to remove excess dyes and fibers. Gentle soap and conditioners are used to help enhance the rug’s softness and bring out the sheen and the colors. The washed rug is then left in the sun to dry for about five days. Once it’s dry, the carpet must be stretched to ensure that the edges are straight and square—since it’s a hand-spun, hand-knotted creation, it is never completely uniform when it comes off the loom. For the final step, our skilled artisans use large scissors to trim the pile, making thesurface even. Later, smaller, long-pointed scissors are used for sculpting between different colors, enhancing the clarity and vitality of the design in the carpet. Now, after 3 to 4 months of meticulous, dedicated work by many people, the hand knotted rug is ready to bring beauty and luxury to any room. 2018 NIBA Designs, Inc. All rights reserved.